Greetings from Los Angeles where the swaying palm trees and gentle desert breeze have me in a dream-like state. Contributing to my bliss is the fact that tonight, I'll have the privilege of seeing The Rolling Stones and Bob Dylan in concert, neither of whom I've ever seen live before. How do you even begin to wrap your head around that? I don't know, so I'm not trying. What I am doing instead is dining al fresco, wondering about the sartorial stylings of my favorite rock stars (like The Beatles) and plotting to wear a black and white sequin bustier to see The Stones inspired by my research for this post. All in a day's work. Ok, next after the Beatles: Mick Jagger. I'm just going to give this verdict up front: Mick Jagger has style, flare, panache, pizzaz, elan, whatever you call it- he has it. Let's examine the photographic evidence, shall we? However, before we go one step further, can we pause to thank the fashion designer whose genius mind conceived of the embroidered silk dinner jacket in the feature image? That is a victory for all of us. Also there is 0% chance I'm not trying red on purple sometime soon, thanks Mick. In red, gold, green, and every color in between. Sound like a verse from the Rolling Stones? It's not. Delicate red embroidery, highlighted with black accents. Photo: AP. Black beaded embroidery on red satin. Photo: Carlos Alvarez/Redfers via Getty Images. Black and gold chevron-patterned sequins. Photo: Mark Metcalfe/Getty Images AsiaPac. Dark green and gold sequins. Photo: Rex Features. Teal and black with a strong sheen, paired with a sequined purple silk shirt. Photo: Eric Feferbern, AFP/Getty Images. Pink with gold and yellow floral accents. Photo: unknown via cltampa.com. A purple sequined ombre jacket with a pink ombre shirt. Photo: Reuters. Geometric silver, white, and black sequins. Photo: AP. Silver and black geometric sequin jacket. Photo: Salwan Georges/Detroit Free Press via AP. It takes something to wear a matching ensemble in such a dramatic color or print. In a light green suit. Photo: unknown. 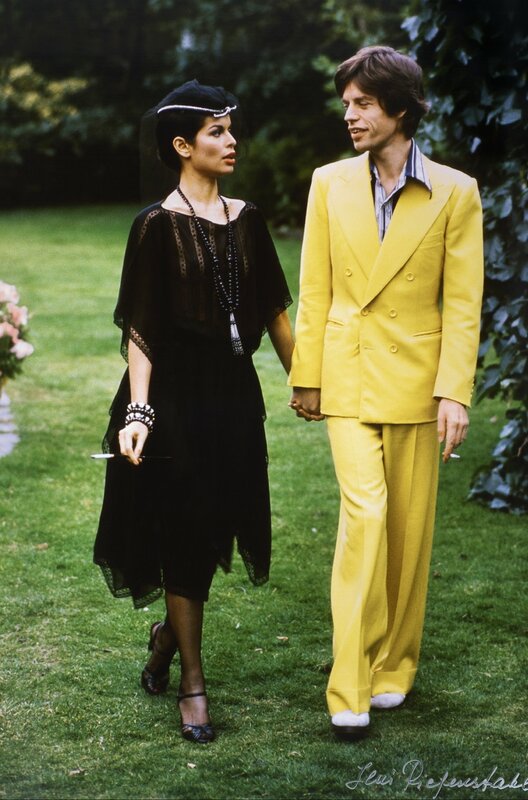 Mick and Bianca Jagger, 1974. Photo: Leni Riefenstahl. A black and gold striped suit, worn with an equally bold tie. Photo: unknown. A checkered suit worn with Marianne Faithful, 1969. Photo: Getty Images. Off duty, Mick adds scarves to retain a touch of drama in his looks. Gold silk scarf with tassels. Photo: Richard Young/Rex/Shutterstock. A patterned, oversized wine-colored scarf. Photo: PacificCoastNews.com. A light pink scarf with tassels worn on stage. Photo: unknown. A navy scarf tucked into a navy blazer. Photo: FlynetPictures.com. A delicate green and gold striped scarf. Photo: Pascal Le Segretain/Getty Images Europe. An early experimenter with androgyny, Mick never shied away from putting together an outfit using unconventional elements. Performing in 1969 wearing a white dress. Photo: Rex Features. 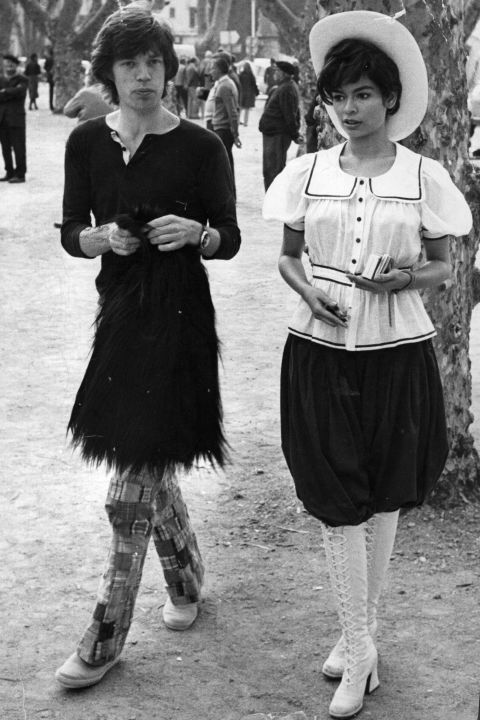 Wearing a skirt, with Bianca Jagger. Photo: Reg Lancaster on Getty Images. Wearing an Ossie Clark velvet jumpsuit. Photo: unknown. Wearing an open fur and tight pants. Photo: Michael Ochs Archives via Getty Images. Performing in a red feather and sequined cape. Photo by Orient´Adicta via Flickr. "The costume helps you be the performer, but it also helps you keep your feet on the ground when you take it off." Costume: a most interesting choice of words, no? It would seem to me we wear clothes to be ourselves, but costumes to become someone else. 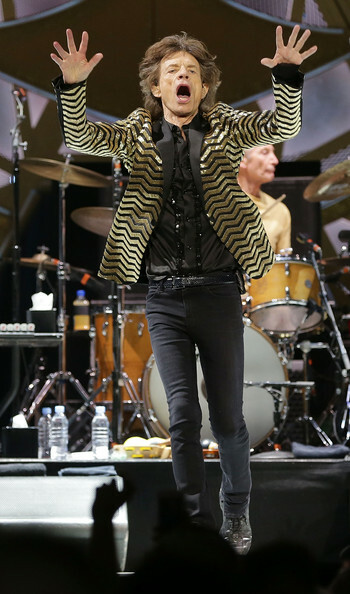 Perhaps it is in wearing such bold clothing that Mick Jagger, the man, enters the persona of Mick Jagger, The Rolling Stone. And his statement makes me feel that both characters in his life: the man and the icon, benefit from the delineation he is deliberately making with his clothing (which reminds me of another entertainer who did the same). If a bold sequin jacket helps a man, who is vulnerable and mortal and harbors fear and pain as we all do, transform into an icon, who is unassailable and invincible and somehow superhuman, I say isn't that a testament to the power of the clothes we wear? A young, pensive Jagger, or is it a young, pensive Mick? Photo: Anwar Hussein, 1973. 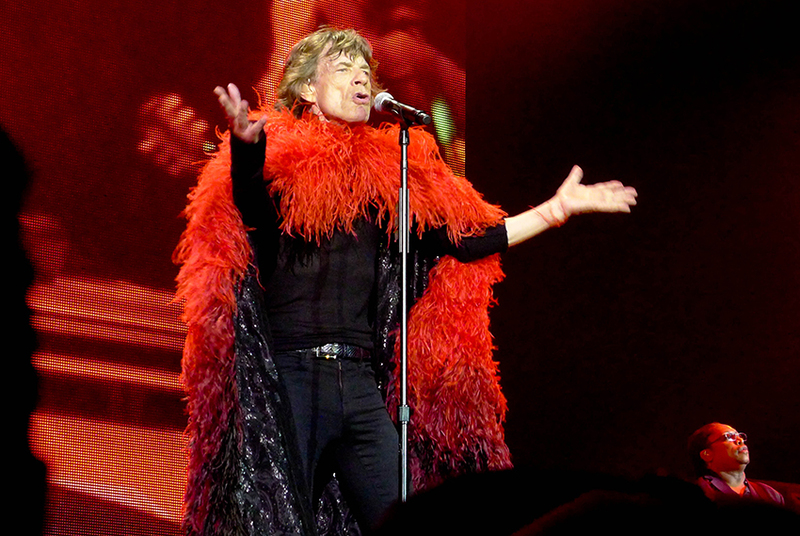 If you have any insight on Mick Jagger's style/costume/clothing-as-prop, I'd love to hear it. Additionally, if you have any thoughts on whether Dylan and The Stones will treat us to Like A Rolling Stone, please share. I mean, don't they technically have to? Will The Stones play Gimme Shelter? The anticipation is beautiful and brutal at once.